To Parkwood Farm and watch cows being milked each day 3.00 to 5.00pm from viewing gallery. Join walk from gate 19 and follow river to gate 10 and onwards through gates 11, 12 & 13. 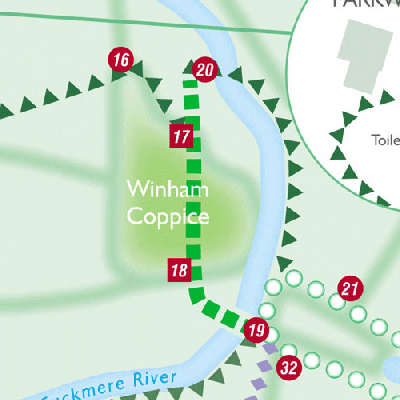 Returning you can retrace your steps, or divert to gates 14 & 15, back to White Walk via gates 16 and 20. Portable toilet at Parkwood Farm. This walk is 2000m/1¼miles. 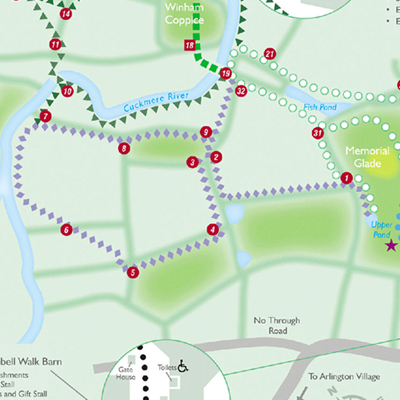 Circular walk of 800m/½mile in Beatons Wood. See carpets of white wood anemones (anemone nemorosa) followed by the bluebells (hyacinthoides non-scripta). Easy walking suitable for wheelchairs and mobility scooters. Takes ½ - 1 hour with many seats to sit and enjoy the views. 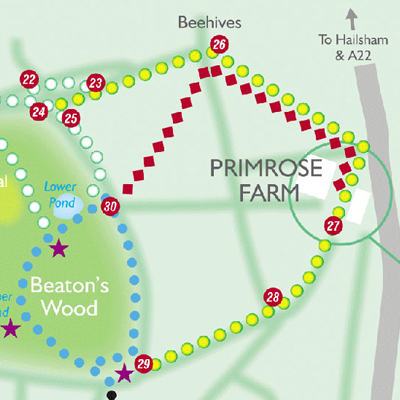 Start at gates 25 or 23 through 26 to Primrose Farm. Leave via 27 and enjoy the extensive views from this higher ground, then to 28 ending in Beatons Wood 29. Back on the Blue Walk turn left and follow exit signs to the Gate House. This walk is 1000m/¾mile. Follow path from the Upper Pond to marker 1. Follow hedge line to marker 2. 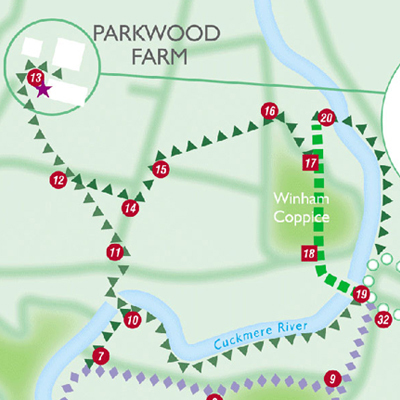 Turn left to gate 3 then marker 4, through copse planted in 1998 to marker 5, across field to gate 6. Cuckmere River is on your left. At gate 7 can join Green Walk over bridge by marker 10, or follow hedge to gate 8 then gate 9. Turn right to marker 2 back to Beatons Wood via marker 1, or turn left through gate 9, where you then have four options: a) return to Beatons Wood via marker 32, b) join Wild Garlic Walk across the narrow foot bridge to flexible stile 18, c) join White Walk through gate 19, d) join Green Walk following the Cuckmere River to bridge marker 10. This walk is 2000m/1¼miles. 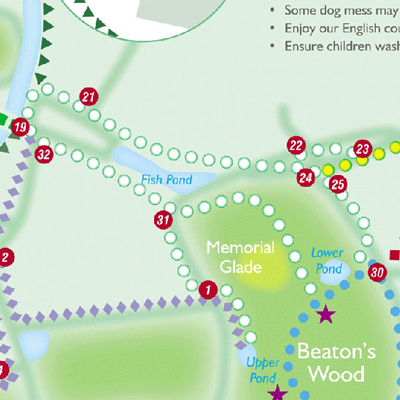 Can be accessed from either the Upper or Lower Ponds and both routes lead you to gate 31. 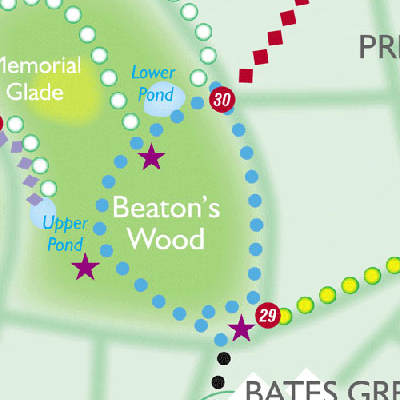 Continue through the gates 32, 19 & 21, but at gate 22 you can either descend the steps to gate 24 back to Beatons Wood, or follow a smoother path to gate 23, then turn right in the field to gate 25 back to Beatons Wood. This walk is 1400m/1 mile. Cross Cuckmere River by narrow footbridge to flexible stile 18, children taking particular care. Through Winham Coppice where wild garlic plants (Allium ursinum) flourish, with strong scent when in flower. At flexible stile 17 either turn left joining Green Walk at gate 16 or walk towards Cuckmere River Bridge at marker 20, joining White Walk at gates 21 or 19, leading back to Beatons Wood. This walk is 300m/¼ mile. 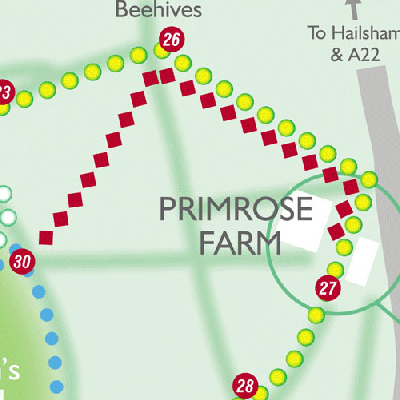 To view the horses and young cattle at Primrose Farm, divert off Blue Walk to gate 30 across the field via 26 to Primrose Farm. 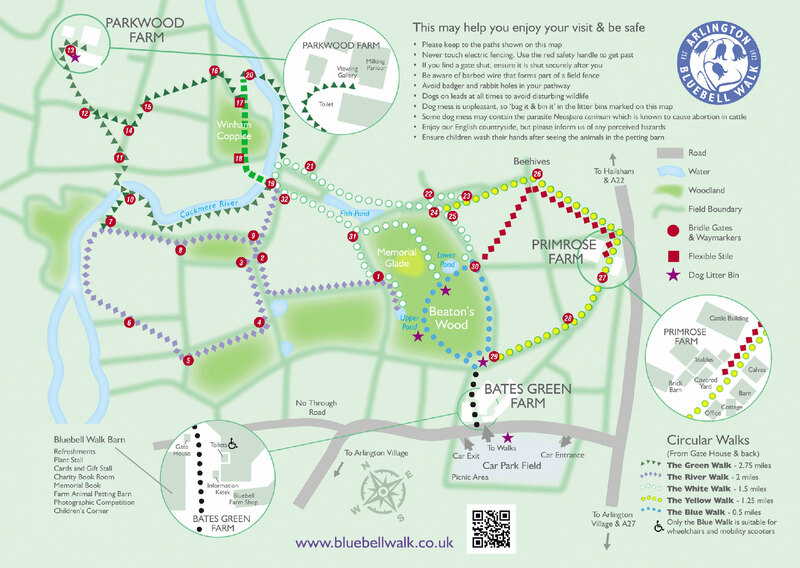 You can retrace your steps, or continue along the Yellow Walk via gates 27, 28 & 29 to Beatons Wood. This walk is 1200m/¾ mile.